Over 150, mostly players who have been in action the last five or six seasons, the oldest were players nominated skated with the 1999-2000 AA Las Vegas Mustangs. Not really. We spoke to Eddie Del Grosso who said he has not read here since our site was Vegashockey.com. Our readers today are worldwide mainly because of the rosters of the WSHL Las Vegas Storm which include a mix of top players and goalies from Europe. His father Scott checks in now and then. #4 How great was Even Zucker as a player. Evan was one of the greatest sharpshooters in roller and ice – one of the best we have ever seen with quick strikes at the net. Yes he sent a note that he has safely arrived for pre-season camp with HC TWK Innsbruck. #5 How great will be the UNLV Rebel hockey team this season. UNLV has its best ever roster, with top coaches in Anthony Greener and Nick Robone. It’s obvious the program is heading to NCAA Division One. However, it’s going to be interesting to see UNLV open its season against a great rival San Diego State in early September at the Las Vegas Ice Center. #7 Where is Brendan Harris of Las Vegas playing this fall. Brendan we are told is returning to the BCHL Wenatchee Wild one more season, then will play at Bemidji State. This is according to pr news releases we’ve seen from Wenatchee. Zach is listed on the roster of the AHL Chicago Wolves for this fall. He is a draft pick of the NHL St. Louis Blues. Chris is regarded as one of the best roller players in Las Vegas, as is Jason Zucker. Yes we did. He was the fastest on the ice on a Las Vegas Outlaws 16u team and interestingly after releasing a pass he would blast off on a high speed route to the net – each time taking a different direction down the ice and then angle towards a different attack area at the net. His skate speed was the best we’ve seen. 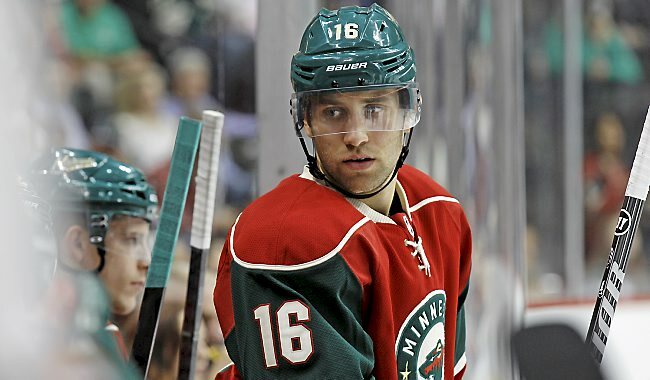 Here is one of Jason Zucker’s greatest goals for the NHL Minnesota Wild. Jason grew up and played roller and ice hockey in Las Vegas. Orland Park, Illinois – Nevada Storm goalie Luke Fundator has been playing in the 2016 USHL Developmental Series Combine (2002 birth year) here this week at the Arctic Ice Arena. The 2016 Combine consists of the best players from all over North America. The USHL Combine is the only scouting event that every USHL team attends, including the National Team Development Program. Luke is the only 2002 player representing Nevada in this years combine series. Eric Atchinson (Las Vegas Native) is participating as well and is representing the Arizona Bobcats AAA Organization. Both players are having a very strong showing. Each of the 16 select teams play 5 games and go through both on and off ice evaluation. Las Vegas hockey coach Rob Pallin is off today – Monday – to join his HC TWK Innsbruck pro team in Austria. Coach Rob will depart on an early morning flight from Las Vegas to Detroit, then connect to Munich. The team plays at the 7212 seat OlympiaWorld Arena in Innsbruck. Las Vegas – While gearing up, packing and getting ready to travel to Austria on Monday, Las Vegas hockey coach Rob Pallin today announced two more signings for his HC TWK Innsbruck team. //6’7″ defenseman Kristian Kudroc of Slovakia. “First round draft pick for the New York Islanders, at 6’7 he is very big and hard to skate against. He played on several Slovakian National hockey teams. Atlanta – Goal scorer Kenny Brooks of Las Vegas has signed with the ECHL Atlanta Gladiators, an affiliate of the NHL Boston Bruins. Kenny, 24, just graduated from the Penn State hockey program where he played four seasons. He had 8 goals, 15 assists last winter. He is listed at 6’1, 201. Las Vegas – UNLV today announced that goalie Erik Eidissen of Sweden and forward Viktor Brask of Sweden have committed to the Rebels for 2016-17. Eidissen is listed at 6’0, 183 and Brask is 6’1, 220. UNLV will open its season against one of its greatest rivals San Diego State in September.